Wire-tapped phone calls with Refuseniks. Addresses hidden on the inside of bubble gum wrappers. Buttons from the largest Jewish rally ever held in Washington. These are some of the items related to the American Soviet Jewry Movement that were digitized and made available thanks to the generous support of the National Historical Publications and Records Commission (NHPRC). From January 2014 to September 2015, Center for Jewish History staff digitized and made available 78,801 images of archival material and 544 hours of audio recordings from the American Jewish Historical Society’s Archive of the American Soviet Jewry Movement. This effort has made trip reports, photographs, posters, speeches, and ephemera openly available across the world via the Center’s central search and digital assets discovery systems. Throughout the Cold War era, Soviet Jews were forbidden to embrace their cultural and religious traditions: learning Hebrew was outlawed, religious expression denied. Exit visa applications were routinely rejected. The American Soviet Jewry Movement emerged from small grassroots groups of students and others outside the establishment in the early 1960s, pushing for the rights of these Soviet Jews and calling for them to be allowed to emigrate. By the early 1990s, the movement evolved into a worldwide phenomenon. As a whole, the American Soviet Jewry Movement was integral to raising awareness of the conditions under which Soviet Jews lived and advocating for the eventual emigration of hundreds of thousands. The materials digitized under this grant capture the American Soviet Jewry Movement’s most influential achievements, such as lobbying, large-scale protests, boycotts, and acts of civil disobedience. They also document the conditions faced by Soviet Jews in the USSR, clandestinely compiled by US activists, and track the evolution of the movement from local grassroots efforts to a national force that shaped foreign policy during the Cold War years. For the digitization work on this particular project, the cost per image was $1.87, and the cost per audio minute was $1.70. These costs encompass staff time on the following steps in the digitization process: fine-tuning of collection selection decisions, physical preparation, metadata preparation, capture, quality assurance of capture, derivative creation, ingest of digital objects into the digital asset management system, linking of digital objects to EAD finding aids, and in the case of audio, additional quality control and description enhancement. “Wire-tapped phone calls with Refuseniks”can be found in “Evidence of Telephone Jamming, Zunshine, Lifshitz,” 1986; Chicago Action for Soviet Jewry Records; I-530; Box 325; Folder 104; American Jewish Historical Society, New York, NY, and Boston, MA. 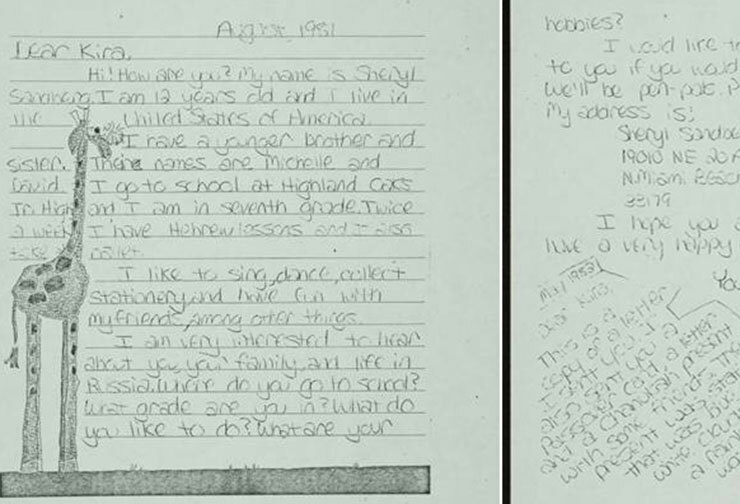 “Addresses hidden on the insides of bubble gum wrappers“ can be found among items 197-202 in “Trip to Visit the Refuseniks in Leningrad, Moscow and Kiev, U.S.S.R.” 1982; Leslie Schaffer Papers; P-923; Box 1; Folder 2; American Jewish Historical Society, New York, NY, and Boston, MA. “Buttons from the largest Jewish rally ever held in Washington” can be found in “Soviet Jewry Movement Buttons with Bumper Sticker and Brussels Conference on Soviet Jewry Identification;” Charlotte Gerber Turner Papers; P-907; Box 1; Folder 5; American Jewish Historical Society, New York, NY, and Boston, MA. A definite highlight among the photographs digitized thanks to the NHPRC grant is a cluster of photographs from the National Conference on Soviet Jewry Collection titled "Sharansky, Anatoly (Natan) and Avital with Milgrom, Ida (82 digital images).” Anatoly (later Natan) Sharansky, a prominent Israeli politician and author, and a former Soviet Jewish Prisoner of Conscience, became an icon of the American Soviet Jewry Movement. During his imprisonment his wife Avital and the American Soviet Jewry movement organizations orchestrated a massive public campaign on his behalf, and on the behalf of other Soviet Jewish Prisoners and Refuseniks. 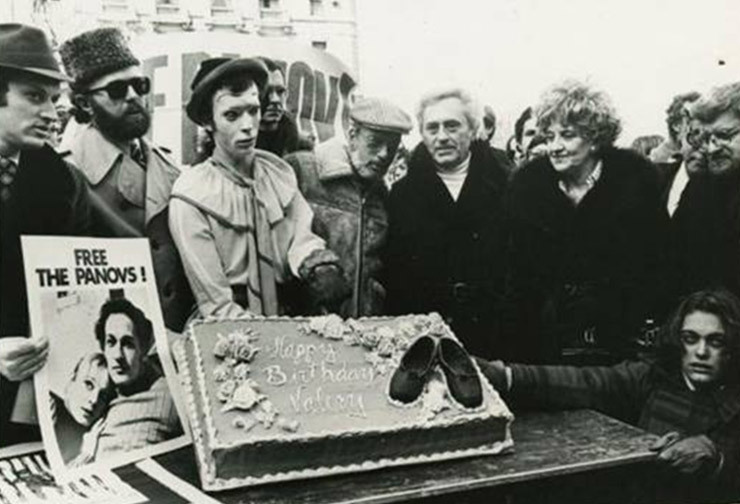 The photographs in the collection date from the late 1970s and 1980s and feature Natan, before and shortly after his imprisonment, his mother, and his wife Avital during their campaign for his release. The photos also feature many American human rights activists and members of the US government campaigning for his release, including Ronald Reagan, George Bush Sr., Bob Dole, Alan Dershowitz, Bayard Rustin and many others. 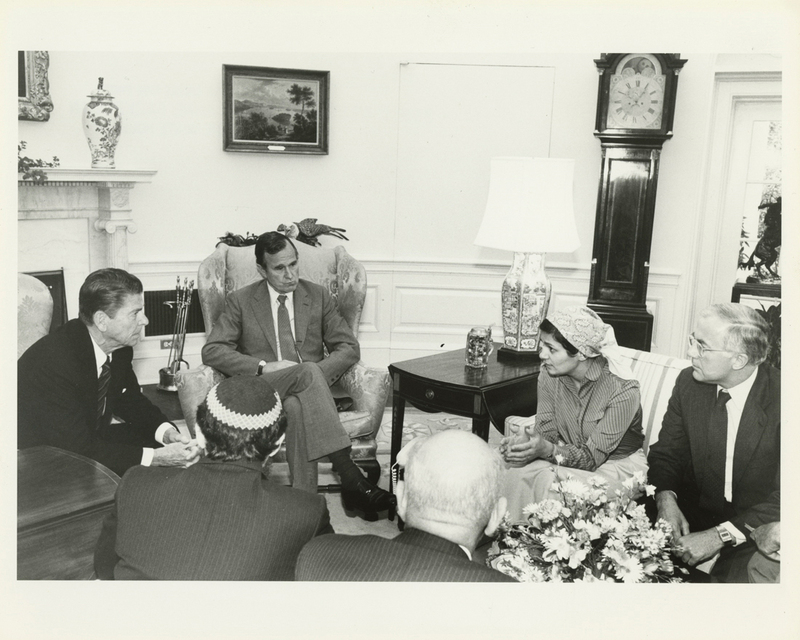 Photograph of Avital Sharansky meeting with Ronald Reagan and George Bush, Sr., 1981. Official White House photograph; Mary Anne Fackelman, photographer; box 362; folder 1; image 2; National Conference on Soviet Jewry Collection; I-181A; American Jewish Historical Society, New York, NY. 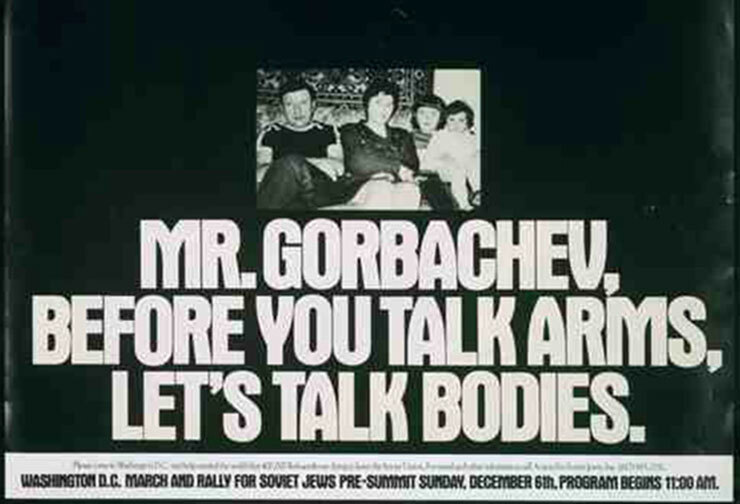 A highlight from the posters collection digitized under the NHPRC grant is the poster calling for mobilization for one of the pivotal events in the history of the Soviet Jewry movement--the Solidarity Sunday for Soviet Jews. The national march and political rally was held on December 6, 1987, the eve of the Washington, D.C. summit between the Soviet Premier Mikhail Gorbachev and U.S. President Ronald Reagan. Over 200,000 participants gathered on the National Mall to demand religious, cultural, and emigration rights for Soviet Jews. The Jewish Telegraphic Agency described the event as the "largest Jewish rally ever held in Washington, D.C.” To this day, this event is considered a powerful example of American Jews of all walks of life coming together in a common cause. 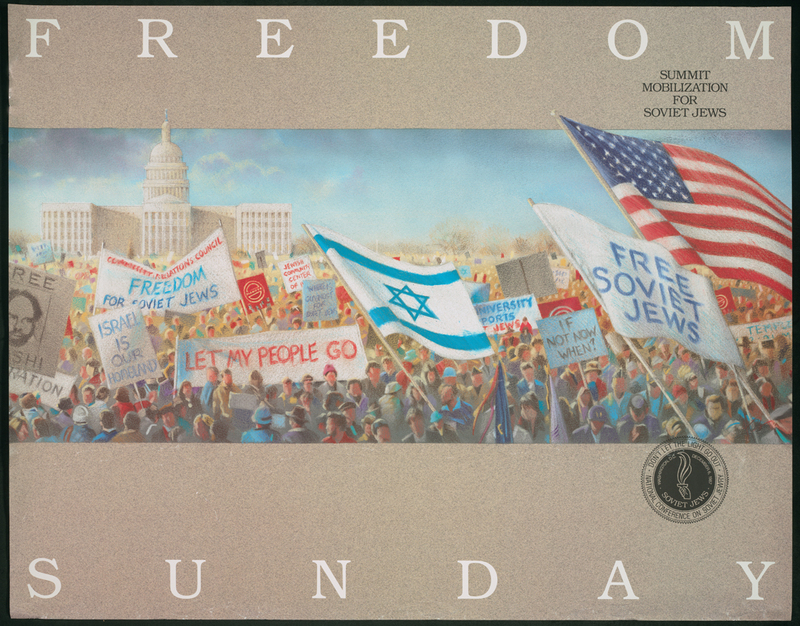 Poster: “Freedom Sunday: Summit Mobilization for Soviet Jews,” 1987; Charlotte Gerber Turner Papers; P-907; MAP 1; folder 1; American Jewish Historical Society, New York, NY. 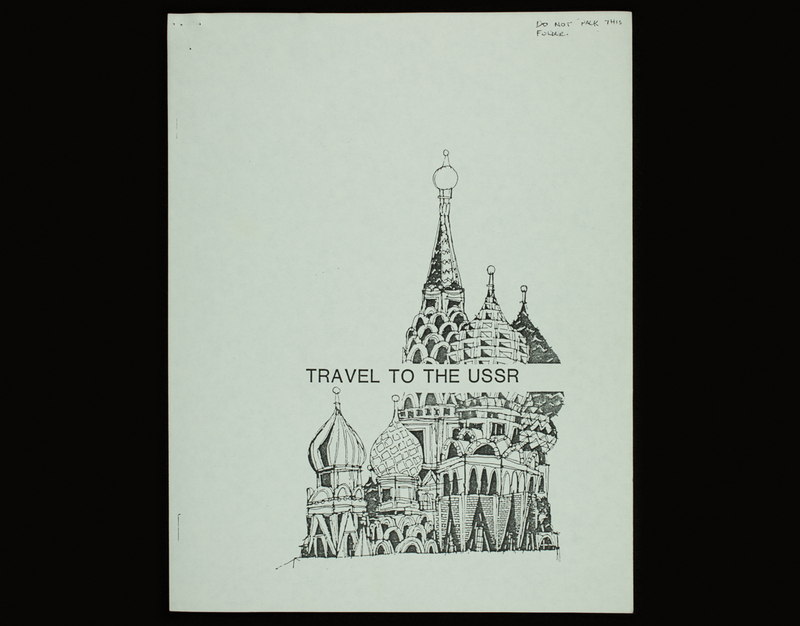 “Travel to the USSR” brochure with note in top corner “do not pack this folder,” circa 1980s; box 9; folder 4; Seattle Action for Soviet Jewry Records; I-507; image 7; American Jewish Historical Society, New York, NY. The leading ballet dancer and choreographer Valery Panov enjoyed a stellar, prolific career in the Soviet Union, leading the best troupes of Leningrad, with many leads in the legendary Kirov Ballet company. 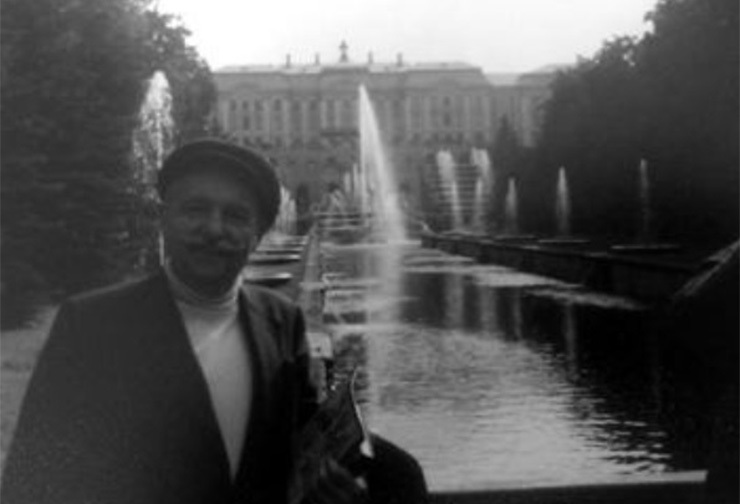 Yet, because he openly criticized the Soviet regime, Panov was not allowed to join the companies on their tours in the West, or to communicate with any of his western colleagues. His career came to a complete halt in 1972, when the Jewish dancer (real last name Shulman) decided to make Aliyah and applied for an exit visa for Israel. He was expelled from Kirov, blacklisted, banned from attending class, evicted from his apartment, tormented by the KGB and eventually imprisoned. 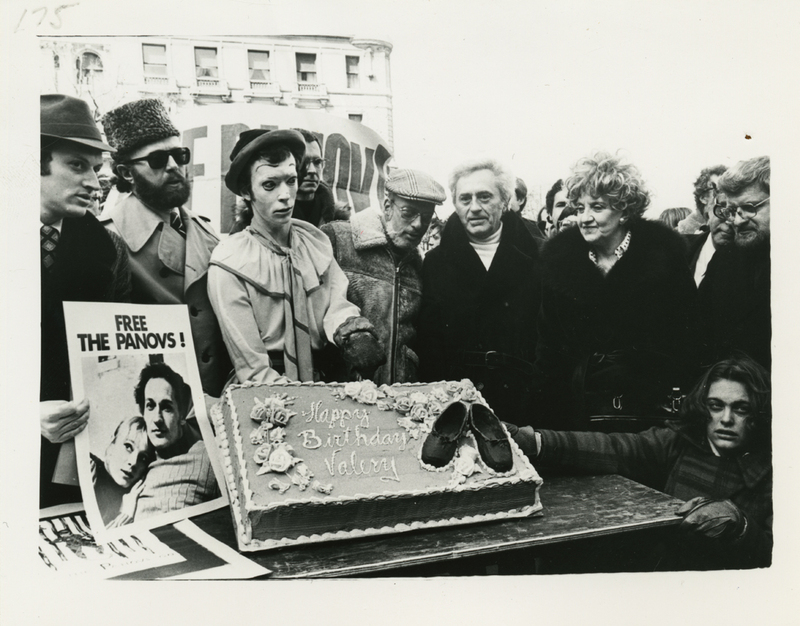 The American Soviet Jewry movement organizations unfolded an unprecedented campaign to free Panov, involving hundreds of celebrities of the stage, screen and the arts, including Laurence Olivier, Antony Perkins, Jack Gilford and many others. 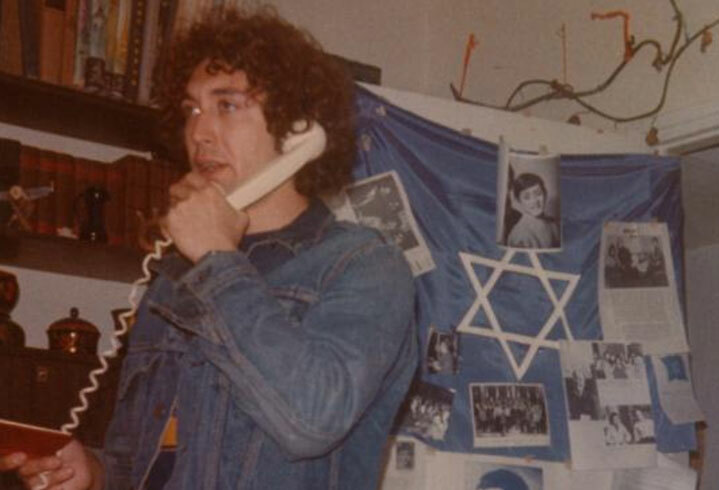 After two years of subjecting Panov and his wife to relentless harassment and forcing him to go on a lengthy hunger strike, the Soviet authorities finally gave in to the pressure from the West and in 1974 Panov was free to fulfill his dream of living in Israel and performing all over the world. Hunger Strike by Alexander Slepak, March 27-April 12, 1987. Audio recording. The cassette contains an audio recording of the event that took place in March of 1987, on the lawn of the U.S. Capitol. The event was intended to call attention to the hunger strike held by the son of the prominent Soviet Jewish activist and Prisoner of Conscience, Vladimir Slepak. The 35-year-old Temple medical student Alexander Slepak conducted a 17-day hunger strike to protest the 17-year refusal of the Soviet authorities to allow his parents to leave for Israel. On the recording Alexander delivers a powerful speech, urging the release of his father and all Refuseniks— "My father fought for many years not only for himself but for thousands of others... Vladimir Slepak has served his term... there is enough suffering." The other speakers, supporting Alexander's cause, include the leaders of the Union of Councils for Soviet Jews Micah Naftalin and Mark Levin, as well as the US Ambassador to the UN Jeane Kirkpatrick and the Nobel Laureate writer Elie Wiesel, both of whom deliver stirring remarks of deep concern about the well-being of Vladimir Slepak and the rest of the separated Jewish families. They make urgent appeals to the Soviet and to the U.S. governments to take decisive steps to end the suffering of the Soviet Jews. The format of the event is a great example of the unity of grassroots activism, represented by the Union of Councils, the US elected officials and the high profile public figures in their efforts on behalf of the Jews in the Soviet Union. 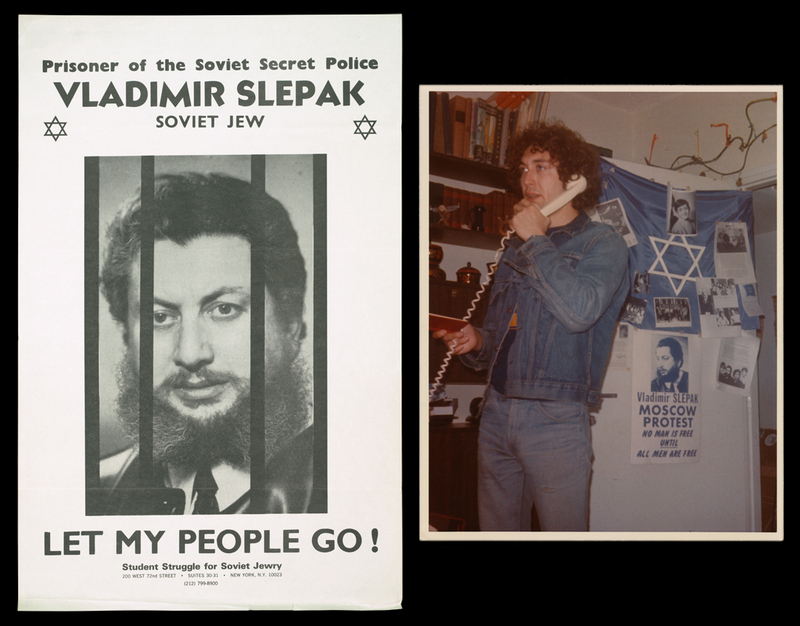 Left: Prisoner of the Soviet Secret Police: Vladimir Slepak, poster by the Student Struggle for Soviet Jewry; Action for Soviet Jewry Records; I-487; American Jewish Historical Society, New York, NY. Right: Son of Vladimir Slepak, Alexander Slepak; American Soviet Jewry Movement Photographs Collection; I-495; American Jewish Historical Society, New York, NY. As one of the Center’s first mass digitization grants, the Center expected a learning curve in multiple areas. Several challenges arose during the course of the project that led to productive innovations in the Center’s approaches to mass digitization work. This project revealed the importance of both using accurate measurements in project planning and carefully tracking production throughout a project. Based on experience with past digitization projects, the Center went into this project estimating that there would be 2,500 images per linear foot. By tracking image counts for every folder, staff discovered that a linear foot of the majority of the material on this project averaged about 1,300 images, not the estimated 2,500. Some of the discrepancy between anticipated and actual counts was due to variables such as the quantity of duplicates held back from digitization, variations in how the materials were foldered and boxed, and fewer double-sided pages than anticipated. Staff members have learned to approach estimates in grant proposals with more care so that future grant projects can be carried out with fewer surprises. In planning future projects, staff now survey a wider sampling of collection materials before estimating an image count. By tracking image counts throughout this and other recent grant projects, staff members also have a stronger sense of averages and estimates for a wider variety of materials to use for future projects. As part of preparing materials for digitization, the Center reviewed all materials—trip reports in particular—for privacy concerns. 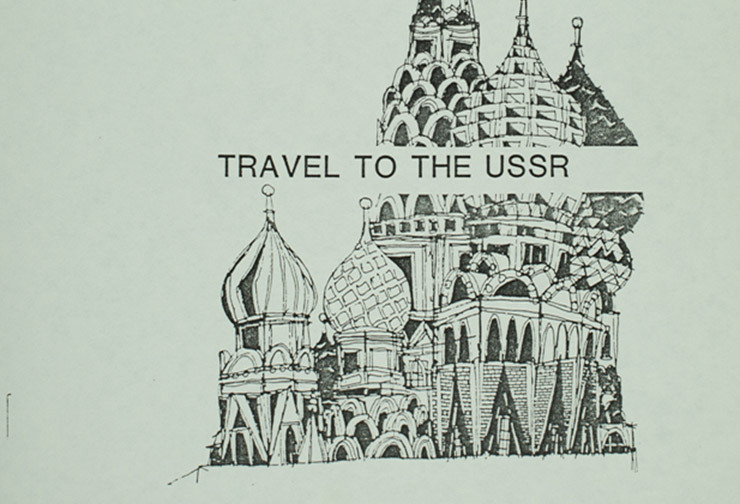 The trip reports were authored by American activists who traveled to the USSR under the pretense of tourism but covertly made contact with Jews there. In the trip reports, they recorded firsthand observations of the conditions, problems, and needs experienced by those living under the totalitarian regime. Staff recognized that some of the contents of the trip reports could be considered personal, sensitive, or even potentially defamatory. Most of them were also marked confidential. In the case of potentially defamatory language, the following disclaimer was agreed upon: “The trip reports found in this collection contain opinions, statements and allegations that may or may not be substantiated. American Jewish Historical Society and the Center for Jewish History do not represent or endorse the accuracy or reliability of any findings, conclusions, recommendations, opinions or statements expressed in the trip reports.” Regardless of what allegations might be made in the trip reports, they will be digitized and made openly available with this disclaimer (1) in the Digitization Note of the EAD finding aid, (2) in a note field that appears in access.cjh.org via the MARC record and (3) in a pop-up disclaimer that appears to the users when they click to view the item. In the case of materials marked “Confidential” or “Not for dissemination” at the time of creation in the 1970s and 1980s, the Center went ahead with digitization and dissemination because the historical and political changes that have occurred in the interim render the information no longer sensitive. Through these policies, the Center and AJHS struck a balance between the provision of access to the digitized materials and the acknowledgement of the sensitive content residing in the trip reports. Trip reports authored by American Soviet Jewry Movement activists comprised the bulk of what was digitized on the project. Originally the Center had planned to use an Epson document feeder for high speed capture of these trips reports. However, after a more thorough assessment of the physical condition of the trip reports, staff determined that using the document feeder would be unadvisable due to the trip reports’ inherent fragility and the potential for damage to them. The Center instead opted to use a Canon 5D Mark III DSLR workstation, which proved safer for the materials and vastly improved image quality. Though this equipment change meant that capture progressed at an admittedly slower rate, the Center arranged staffing and workflows such that the materials were digitized well within the project deadline. After completing the imaging and ingest of a large number of trip reports, discrepancies among existing metadata and the digitized materials were discovered. For some collections, the Center found that folder numbers in the finding aid did not match the number on the physical folder, leading to confusion with file names, which are based on folder numbers. For one particular collection, links to trip reports were off by one folder, so that every folder after the incorrect folder linked to the wrong trip report. This discovery led to the development and implementation of a post-ingest quality control step in which professional staff uninvolved in previous steps of digitization were asked to review links from finding aids to digital objects. This post-ingest review caught other issues, sometimes pertaining to difficulty in matching digital object id numbers to intellectually arranged finding aids and sometimes simply the result of human error. Center staff also developed a more robust system for the review of physical materials prior to digitization which will be implemented in future projects. The development of these additional quality control workflows has allowed the Center to more confidently complete this project and approach future mass digitization projects with more experience in the complete workflows necessary for quality outcomes. The process of ingesting digital objects into the Center’s digital asset management (DAM) system was radically improved over the course of the project. A few months into the project, Center staff recognized that ingest was a bottleneck in the digitization workflow. The ingest method in use at the beginning of the project had been originally developed to serve boutique digitization needs and worked well for small-scale projects. A few months into the large-scale Soviet Jewry digitization project—one of two large digitization projects concurrently underway—the Center recognized the need for a new ingest method able to handle large-scale ingests. In summer 2014, staff developed several new approaches to ingesting various types of materials. The most significant of these was to use CSV files to ingest large batches of materials. Where the Center had previously been ingesting materials one folder (between 2-200 images) at a time, the Center could now ingest dozens of folders with thousands of images at once. Once developed, this CSV ingest method was used for all the trip reports and audio. The Center’s Digital Services staff are now capable of a wide variety of methods of ingest. The Center has the ability to choose which method to use based on the materials themselves, ranging from posters that warrant item-level ingest to archival documents that warrant box-level ingest. Among the deliverables for the grant project were 500 hours of audio, mainly from cassette tapes held in various Soviet Jewry collections. Since processing archivists had not been able to listen to cassettes to check and describe their contents, they generally either simply transcribed the labels or described the group (“X number of unlabeled cassettes”). This created a challenge for digitization— staff had to take extra care to check that the cassette contents reflected their labels and, in some cases, provide labels and description for the first time. Because staff could not check the contents of an audiocassette prior to digitization, as staff generally could with paper materials, the project team carried out a kind of reverse quality control process. A digital lab technician digitized the tapes, and a Russian-speaking archivist (who also happens to be the former archivist of AJHS’s Archive of the American Soviet Jewry Movement) checked the contents against the description. Through this reverse quality control, staff corrected and expanded description for hundreds of hours of audio. There were also a few surprises among the audio. For example, one tape labeled as if it held a recording of a phone conversation actually held a Weird Al Yankovic song—it seems as if the activist may have meant to record over this song but may have forgotten to hit "record." The former Archive of the American Soviet Jewry Movement archivist, now an archivist at the Center, initiated the compilation of a handful of items digitized over the course of the grant project. The first two of these digitally reunite audio and slides to recreate slideshows. The below videos are available via Youtube, and the two recreations are also available via the Center’s discovery systems. “Refuseniks: Heroes of History” Slideshow – Archive of the American Soviet Jewry Movement – This video recording was created to digitally reunite the photographic slides and audio recording that initially accompanied the slides to emulate a screening of slideshow. “Children’s Tale” – slideshow on Jewish children in the USSR – American Soviet Jewry - This video recording was created to digitally reunite the photographic slides and audio recording that initially accompanied the slides to emulate a screening of slideshow. Sharansky Slideshow – Archive of the American Soviet Jewry Movement – Leading Soviet Jewish activist and Prisoner of Conscience Natan Sharansky speaking at the Conference of Presidents of Jewish Organizations (excerpt) shortly after his release from the Soviet prison camp where he was held for 9 years. Illustrated by AASJM photographs of Sharansky and those who campaigned for his release in the United States. 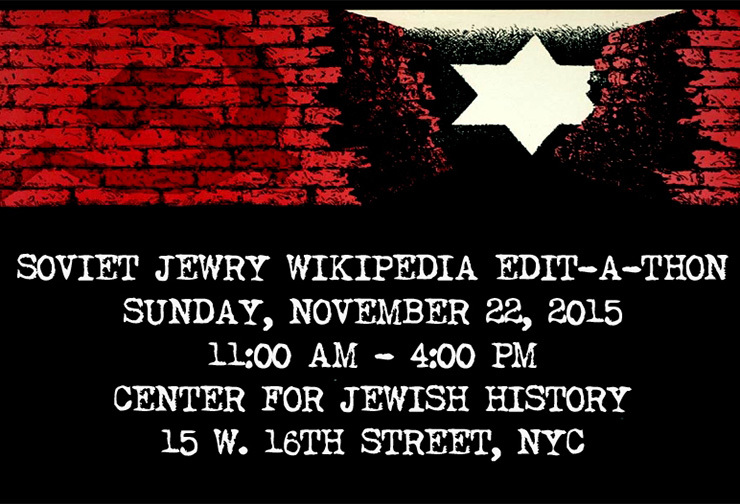 A Wikipedia edit-a-thon focused on improving Wikipedia content related to Soviet Jewry was held on November 22, 2015. 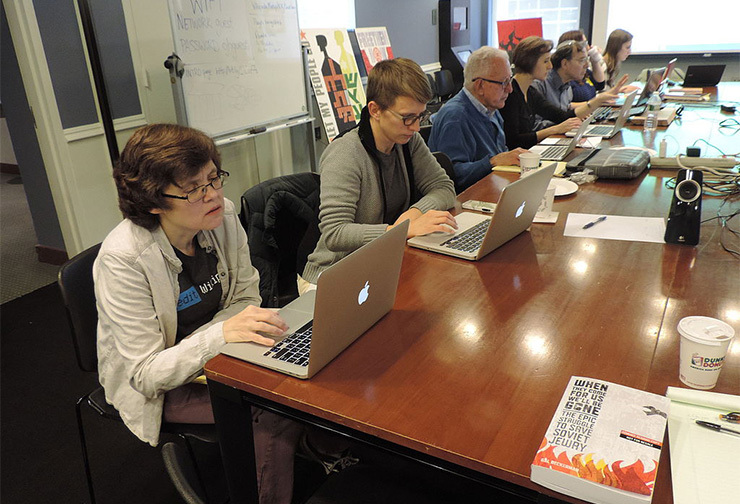 Attendees included archivists, local Wikipedians, and two prominent Soviet Jewry activists. New Wikipedia pages created during this event include Avital Sharansky, Morey Schapira, Pamela Cohen, and a Russian-language page for Jacob Birnbaum. Project staff members Eric Fritzler and Leanora Lange joined Archival Services Manager Kevin Schlottmann and staff of two other institutions on a panel titled “Beyond Boutique: The Shift from Selective to Mass Digitization” at the Metropolitan New York Library Council’s Annual Conference in January 2016. Slides from the presentation are available here. The digitization work on this project took place in the Center for Jewish History’s Collection Management and Conservation Wing, which includes The Gruss Lipper Digital Laboratory, The Shelby White and Leon Levy Archival Processing Laboratory, and The Werner J. and Gisella Levi Cahnman Preservation Laboratory, and was opened to public view in May 2011. With the opening of these labs, the Center created new ways that the public can engage with the “behind the scenes” conservation, archival processing, and digitization work. The Center’s project team expresses sincere gratitude for collaboration with Susan Malbin, Director of Library and Archives at the American Jewish Historical Society. The Center’s experts are leaders in unlocking archival material for a wide audience through the latest practices in digitization, library science, and public education. As one of the world’s foremost research institutions, the Center offers fellowships, a wide array of exhibitions, symposia, conferences and lectures. The Center is a Smithsonian Affiliate, and is a partner of the Google Cultural Institute. The Center for Jewish History is home to the Lillian Goldman Reading Room, Ackman & Ziff Family Genealogy Institute, The David Berg Rare Book Room and The Collection Management & Conservation Wing. Public programs create opportunities for diverse audiences to explore the rich historical and cultural material that lives within the Center’s walls.